Seven people have died and a woman is in intensive care after undergoing kidney dialysis treatment at a hospital in northern Vietnam. The incident happened at Hoa Binh Province General Hospital, west of the capital, Hanoi, on Monday. Eighteen people were being treated when some felt sick and breathless. Six patients died on Monday afternoon and another later that night. Vietnamese authorities have launched a criminal investigation. "I would like to apologise to families and the whole community; we are very surprised at this rare incident," hospital director Truong Quy Duong told state media. The 18 patients were receiving routine dialysis, a process that cleans the blood and removes waste products - often by passing blood through a machine - for those whose kidneys have stopped working properly. Le Tien Dung, whose wife is in intensive care, told AFP news agency that his wife had fallen ill during the treatment. "She became itchy all over her body, she had a stomach ache and vomited," he said. "My biggest hope is that my wife will overcome this." The remaining 10 patients have been transferred to another hospital in Hanoi and are reported to be in stable condition. This is one of the worst medical incidents in Vietnam in recent years. Health authorities are trying to identify the cause and police in Hoa Binh have opened their own criminal investigation into suspected misuse of medicines. On social media, many people have been shocked and disturbed. But in an apparent attempt to curb speculation, some early posts on Facebook were removed. Patient safety in Vietnam's health care system - a mixture of government-funded and private facilities - has been in the spotlight in recent years. In December, two people died at a Hanoi hospital due to anaesthesia procedures ahead of surgery. In 2013, three children died in Quang Tri after being given the wrong vaccinations. 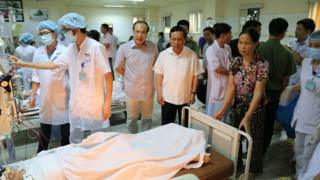 State media said Deputy Prime Minister Vu Duc Dam had visited the Hoa Binh hospital and called for "all available resources" to help the surviving patients. Health ministry officials were at the hospital and must report findings by the end of Tuesday, it said. Why do Vietnam's patients bribe their doctors?